Over kill on my 'must have' polishes, I know... 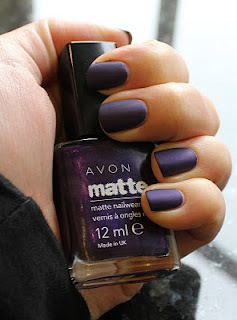 But came across Avon's new polishes in Matte (which I usually hate) and I think it looks pretty amazing!!! It comes in an array of matte colours and even though they are quite wintery, there is nothing wrong with stocking up! The one down side is that the polish isn't great on the chipping front, however Rimmel has a Matte Top Coat to prevent this, thus problem solved! This one is called Voiletta, still keen to try the Grey Cement.